Although the Apollo spacecraft was a truly amazing machine for its time, it was, in many ways, extremely marginal. Only by the very careful husbanding of all the consumables it carried could a mission be completed. There was little room for error or excess. However, it was sometimes difficult to measure how much of a resource was being consumed. Hydrogen and oxygen were relatively easy. The tanks had sensors to directly measure quantity, the flow of these two elements to the fuel cells was well understood and the power produced was directly related to their consumption. If power was being produced as expected, then the amount of water available for cooling, food and drinking would be well known. Oxygen flow for the cabin air supply was also directly measured. 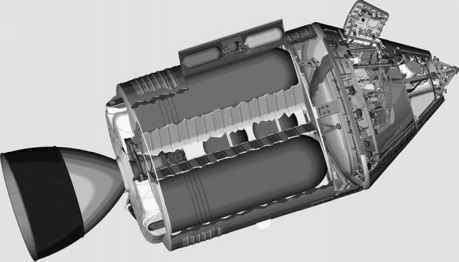 The propellant for the RCS thrusters presented a greater problem and illustrated some of the indirect techniques used by flight controllers to understand how much remained - for like so many systems on Apollo, the functioning of these little engines was crucial to the correct execution of the flight. Propellant quantity was not directly measured because this is always difficult to do in weightlessness. Instead, controllers used every form of data available to them to make estimations of usage. The tanks contained the fluids within bladders to ensure that only liquid was expelled to the thrusters. As propellant was consumed, the space between the bladder and the tank walls was filled with helium that applied pressure for expulsion, and as this volume increased, the overall helium pressure reduced. Also, every thruster firing was telemetered to Earth, which allowed the usage for each quad cluster to be summed. However, techniques such as these gradually built up errors that became greatest towards the end of the mission, just when controllers wanted to know the quantities remaining most accurately. Controllers made use of the fact that each quad cluster had a primary and a secondary pair of tanks - four tanks in all - and that the secondary pair constituted 39.5 per cent of the total available. Therefore, by switching across to the smaller tanks at some point, they knew precisely how much propellant remained available to that quad. In order to avoid running the primary tanks empty, this 'crossover' was carried out when the total remaining had been calculated to have reached 43 per cent. It gave them an accurate data point to work from as they kept track of the quantities for the remainder of the mission.